To ROCKUP thanks for keeping the kids happy & active. You certainly are patient. Noho ora mia - Raukura Hauora O Tainui John, Racheael, Ani & Dallas. Are you getting stressed booking activities for your next event ? ROCKUP has over 25 years of experience, so can give you helpful hints and ideas to make your job easier & offer formats that will work to your budget. Do you want Original Attractions that actively work to promote business & deliver results? Do you want to take the hassle out of organizing your school camp or activity day ? 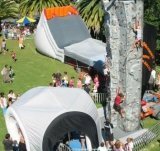 ROCKUP delivers programs to your school or camp venue for the cost of a Bus hire. Would you like a themes for the day, to add lots more fun ? Would you like your team to take less sick days, have a better attitude towards clients and be more productive working as a team ? Would you like to know that the equipment you are hiring and paying for is clean, bright & colourful with delivery & setup on-time ? ROCKUP is a 100% NZ owned & operated business who takes pride in delivering clean, unique quality equipment always ready to go on-time.